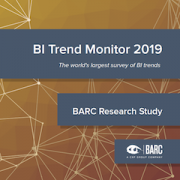 The Business Application Research Center (BARC) publishes BI Trend Monitor 2019, a survey-based review of twenty of the key trends dominating today’s global business intelligence (BI) market, at its annual BI & Data Management Congress in Frankfurt this week. 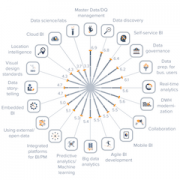 Many organizations are now striving to become data-driven enterprises according to recent research by BARC. Despite featuring in BI Trend Monitor for the first time this year, data-driven culture was identified as the fifth most important trend in a survey of 2,679 BI users and consultants. A marked regional variation in survey responses reveals that organizations in the Americas attach far more importance to this trend than European companies. In fact, North American companies vote it as their number one trend and South American respondents make it their number two trend. 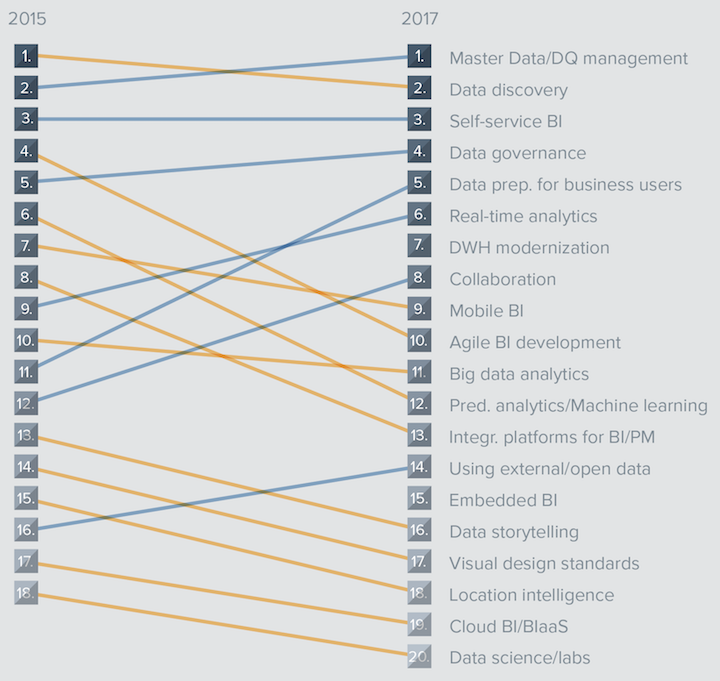 Trends that have clearly increased in importance compared to last year include agile BI development and advanced analytics and analytics teams. Having risen in the rankings last year, data governance is voted as the fourth most important trend in BI for the second year in a row, and GDPR almost certainly has a bearing on this finding. Although data governance covers a much wider spectrum than ‘just’ providing data protection, its rising significance can also be traced back to an increase in data security awareness partially brought about by legislation. The impact of GDPR is being felt beyond the European Union where it was enacted. The new regulation covers the data protection and privacy of individuals in the EU but it affects businesses that deal with Europe all over the world. The Business Application Research Center (BARC) is an enterprise software analyst and consulting firm with a focus on Analytics/Business Intelligence (BI), Data Management, Enterprise Content Management (ECM), Customer Relationship Management (CRM) and Enterprise Resource Planning (ERP). Along with analysts CXP and PAC, BARC forms part of the CXP Group – the leading European group of analysts for enterprise software and IT services with staff in eight countries. 31% of new BI deployments in the last two years have been on cloud-based platforms, compared to only 14% of BI projects undertaken more than two years ago. Of all the BI trends monitored in The BI Survey 18, cloud BI adoption has seen the sharpest upturn in the last two years. 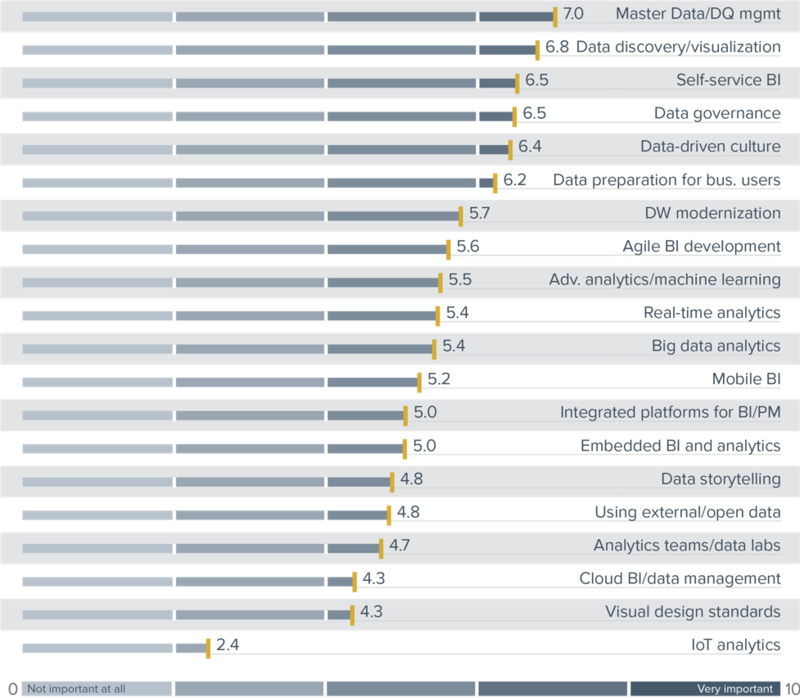 Visual analysis (68% within the last two years vs 58% over two years old) and mobile BI (37% vs 27%) are the next closest. Respondents’ top four reasons for purchasing a BI tool are flexibility, ease of use for report recipients, functionality and price-performance ratio. Since 2003, reasons to buy have remained pretty consistent, with most varying by less than ten percent in that time. Ease of use has varied the most, but in the past six years it has been consistent at around 40 percent. The largest recent fluctuation is functionality, which has decreased by over ten percent since 2016. The median percentage of BI users in companies taking part in The BI Survey has risen from 10% in 2014 to 13% in 2018. 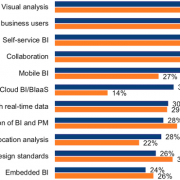 Further analysis reveals that companies claiming to have achieved the most benefit from their BI tools (“Best-in-Class”) have on average 9 percent more BI users than those achieving the least benefit (“Laggards”), suggesting that there is a relationship between the number of BI users and the degree of benefits an organization gains. This relationship should provide an incentive for businesses to maximize BI tool penetration and train as many employees as possible to use their BI tool. 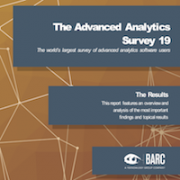 The BI Survey is BARC’s long-running annual survey-based study into the BI software market. 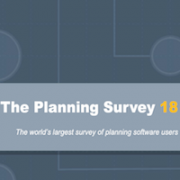 It is based on user opinion about software selection, implementation and usage from over 3,000 BI professionals worldwide. Detailed feedback on 36 BI products is analyzed and compared. Visit https://bi-survey.com/business-intelligence-software-comparison to perform interactive, high-level product comparisons. 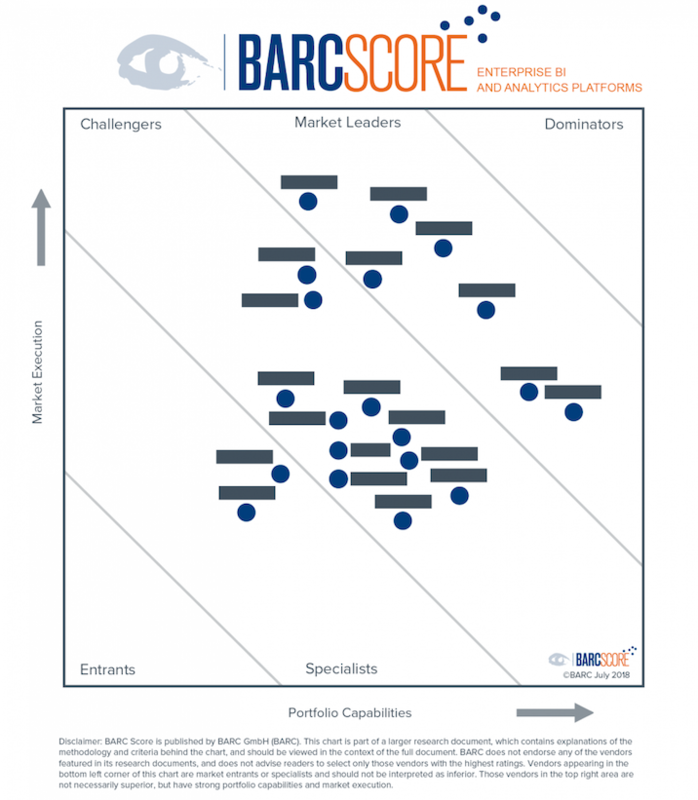 The Business Application Research Center (BARC) has published the fourth edition of BARC Score Enterprise BI and Analytics Platforms. The independent consulting and analyst firm ranks 20 market-relevant, international providers of business intelligence (BI) and analytics platforms based on an extensive list of criteria, as well as user feedback. 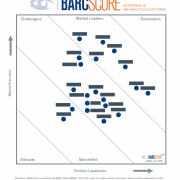 Several changes in the BI market over the last twelve months are reflected in this year’s BARC Score. OpenText has moved from the Specialists segment to the Challengers category. Having launched its Magellan product a year ago to address analytics requirements in particular, OpenText has also improved the integration between its existing products, which is reflected in a better rating. 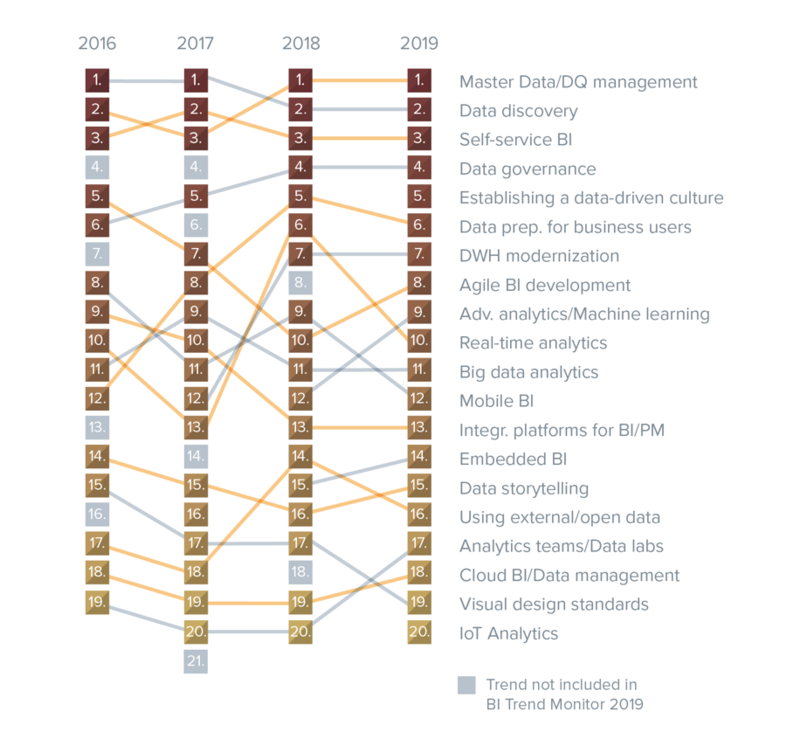 The “golden mean” in the Challengers category remains very similar to last year, with representatives including providers such as Tableau, SAS, Hitachi Vantara, Infor, BOARD, TIBCO, TARGIT, Yellowfin, Dundas and Pyramid Analytics. The minimal change might give the impression that these providers have not developed any further functionally, but overall, it is evident that they have invested in areas such as data discovery and especially data preparation and modernizing their software. Most of the movement in the Market Leaders segment has been on the market execution side. SAP and Microsoft are enjoying growing demand for their SAP Analytics Cloud and Power BI products, which is reflected in improvements for both. 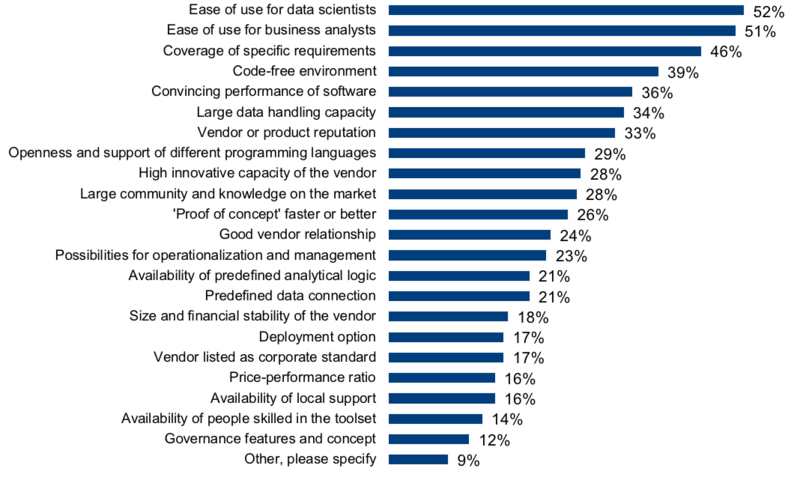 Providers such as IBM, Oracle, Information Builders, Qlik and MicroStrategy remain among the Market Leaders with their already broad product ranges, which have developed well, especially in the data discovery area. Movements on the market execution side are strongly influenced by customer satisfaction ratings from The BI Survey 18. In the Specialists segment, Sisense is putting further investment into enhancing its web client with data management functions. Dimensional Insight is strengthening its offering for specific sectors, and has launched an interesting product with predefined content. Providers must fulfill a number of technical and commercial criteria to be included in BARC Score Enterprise BI and Analytics Platforms. They must cover four of the six product categories (formatted and ad hoc reporting, dashboarding, analysis, data mining, planning and self-service BI/data discovery), and achieve an annual revenue from licenses and maintenance of 15 million euros in at least two geographic regions. All global economic regions are considered, i.e., Europe, Middle East and Africa (EMEA), North America, Latin America and Asia/Pacific. Open source providers are evaluated according to their total revenue as they do not usually charge license fees. The complete BARC Score document, which includes a characterization of each provider and a summary of their strengths and weaknesses, can be purchased from BARC here. The Business Application Research Center (BARC) is an enterprise software analyst and consulting firm with a focus on analytics/business intelligence (BI), data management, enterprise content management (ECM), customer relationship management (CRM) and enterprise resource planning (ERP). For over twenty years, BARC analysts have combined market, product and implementation expertise to advise companies and evaluate BI, data management, ECM, CRM and ERP products. A long-running program of market analysis and product comparison studies forms the basis of BARC’s comprehensive knowledge of all the leading software vendors and products, as well as the latest market developments and trends. 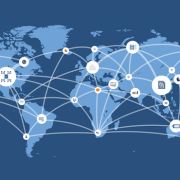 Along with analysts CXP and PAC, BARC forms part of the CXP Group – the leading European group of analysts for enterprise software and IT services with staff in eight countries. For further information, visit www.barc-research.com, www.bi-survey.com and www.barc.de (in German). A new BARC/CXP Group study finds that organisations are looking to use the onset of the General Data Protection Regulation (GDPR) to make better use of their data. The report “Managing Personal Data Beyond The GDPR” is based on briefings with more than 200 senior business and IT executives at medium-sized and large companies operating across manufacturing, services and the public sector in Europe. 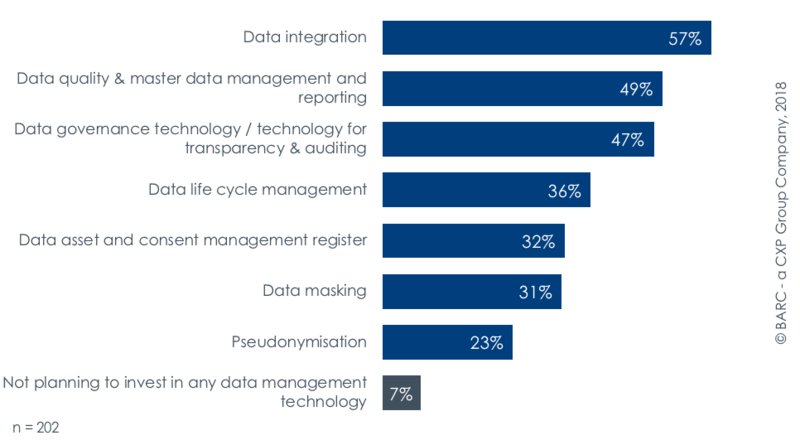 57% of those surveyed plan to acquire data integration tools; 49% are looking to invest in data quality, including technologies for master data management and reporting; and 47% are evaluating technology to enhance their data governance to achieve data transparency and enable auditing. Figure 1: What data management technologies are you planning to invest in (following your GDPR assessment)? Only 19% of respondents believe their organisations will be fully ready for GDPR before the introduction date on 25th May, having completed and tested their preparations. The United Kingdom (67%) sees itself as the most GDPR-ready region while the traditionally data-sensitive DACH region (Germany, Austria and Switzerland) is the least ready at 54%. Manufacturing is the best prepared of all vertical sectors. With only two months to go when the survey was conducted, 60% were still confident they would be ready in time, while nearly one in three said they won’t be. Many of the companies surveyed strongly agree that GDPR will bring benefits to their business in the way their customer data is used. The most frequently anticipated benefit is faster cleansing of data and a consequent rise in data quality at 36%. 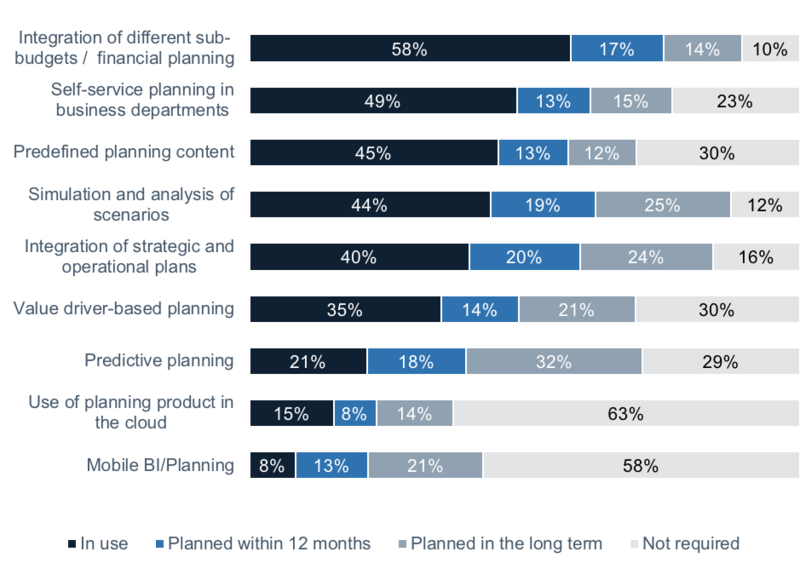 Other benefits expected are better decisions in business units and controlling due to more reliable data (33%); making data more rapidly actionable and valuable (30%); providing better customer knowledge and marketing (28%); and accelerated development of new digital products and services (28%). Only 1% of participants feel that GDPR will have no impact on their use of customer data. “Managing Personal Data Beyond The GDPR – How will European organisations remain compliant and manage their data in the next five years?” is based on a survey conducted in Europe in January and February 2018, and has been published today. More than 200 companies with over 250 employees in the United Kingdom and Ireland, France, the DACH region, Southern and Eastern Europe as well as the Nordic and Benelux regions were surveyed by telephone (CATI). The study was prepared in the multi-client model and supported by gold sponsors Ab Initio and Talend. ‘Managing Personal Data Beyond The GDPR’ is a survey-based study published by BARC in April 2018. We asked 200 CXO-level business and technology decision-makers across Europe about their preparations for GDPR and the impact they expected the new legislation would have on their organisations. Click here to find out more and register to download the executive summary. The Business Application Research Center (BARC) publishes BI Trend Monitor 2018, a comprehensive review of the trends dominating today’s global business intelligence (BI) market, at its annual BARC Congress this week. For the first time, BI users and practitioners identify master data / data quality management as the #1 trend in the business intelligence (BI) industry at the moment. In third position last year, this trend now occupies the top spot ahead of data discovery / visualization and self-service BI. BARC’s BI Trend Monitor is based on a survey of more than 2,700 BI professionals about the importance of BI trends in their daily work. Trends ranking higher now compared to previous years include data governance, real-time analytics, collaboration and using external/open data. Data preparation for business users has also enjoyed a particularly sharp rise in popularity, and its relevance is recognized quite evenly across all industries and company sizes. However, North American companies have been much quicker to adopt this trend than their European counterparts. The Business Application Research Center (BARC) is an enterprise software analyst and consulting firm with a focus on analytics/business intelligence (BI), data management, enterprise content management (ECM), customer relationship management (CRM) and enterprise resource planning (ERP). For over twenty years, BARC analysts have combined market, product and implementation expertise to advise companies and evaluate BI, data management, ECM, CRM and ERP products. A long-running program of market analysis and product comparison studies forms the basis of BARC’s comprehensive knowledge of all the leading software vendors and products, as well as the latest market developments and trends. Along with analysts CXP and PAC, BARC forms part of the CXP Group – the leading European group of analysts for enterprise software and IT services with staff in eight countries.